I like this too! It would make me feel I had accomplished something rather than just have a handful of half finished projects! 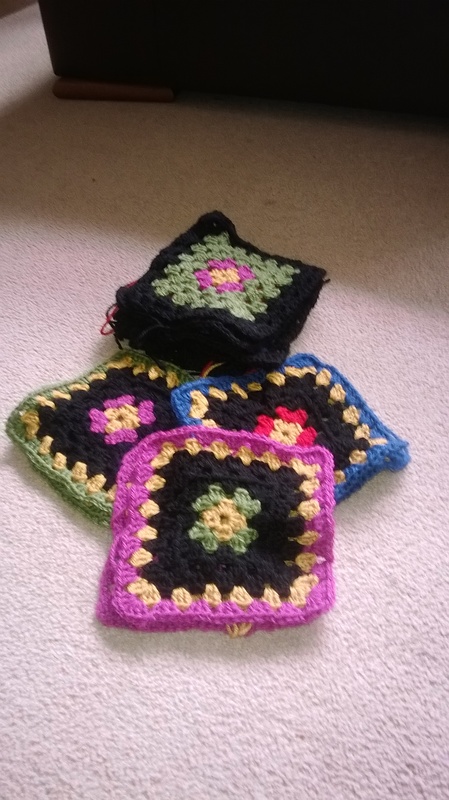 Granny Squares is my latest thing …. this week anyway! My knitting has come to a halt. My sewing has come to a halt. I am going great guns with a little crochet at the moment though. I think it was the need for something portable that fuelled this and last weeks granny square frenzy. I was wondering just what to take whilst travelling on the bus and train recently. I have a purple cardigan on knitting pins which kind of called out to me but I decided it was just too bulky to carry every day. I’d gotten to the sewing up stage and I know that is something I can never contemplate whilst travelling! Sewing is probably the worst part of knitting to me. I put it off time and time again! A ‘lifetime’ ago I used to have a daily commute of 90mins and I went through a phase of enjoying hand quilting. I remember the pile of hexagons in my bag, on my lap, falling on the floor, the hunt for the missing sewing needle ….. I must have been a nightmare fellow traveler but in the bliss of youth didn’t give it a second thought! Then I moved onto knitting (hurrah), resurrecting a craft I had neglected for years. It was so fab for me – all that time just sitting in one place – happily knitting away – chatting to friends around me (I was one of those who commuted the same long distance regularly, collecting fellow commuters as friends along the way – oh it was a ball some mornings! I even gained a boyfriend on this journey, years before I was married of course! He and hubby are not one and the same, thank goodness.) The knitting was definitely more successful, though the occasional dropped knitting needle was a real ache! Of course, the days the needles went were those when I was sat next to strangers, those usually grumpy middle aged men in suits who were not impressed to be asked to stand up whilst I rooted inbetween our seat cushions! As I said, I was probably not a great fellow passenger then but didn’t realize it. I apologise if you were one of those asked to move on the 06.37 Hastings to Cannon Street train in the early 1990’s. So, recent train journeys are much shorter and so far I have not made ‘friends’ with others, but I have noticed some surreptitious glances my way – whether this is wonder or horror at what I am doing I have yet to work out. Sharing this with my teenage son he reckons it was horror, but then he reckons his mum is just not ‘normal’, ha ha. I shall not change who I am, I love living in a woolly place and to sit idle is just not ‘me’. A pile of granny squares in the pic … this is just the beginning. This entry was posted in Uncategorized and tagged commute, granny square, Hastings, knitting, quilt. So been there too! Thank goodness we know our mojo for knitting WILL return. I read a couple of books instead recently, really enjoyed complete escapism. Your first/next problem will be just what to make first. Good luck! So the sad fact is there has been hardly any knitting going on here at the home of your local Introverted Knitter. Well technically that isn’t true, the knitting that has happened hasn’t actually happened at my place. My favorite knitting group got together about a week ago and I managed to crank out a few rows on the bachtus shawl (which is still missing photos.) I don’t know if it is because I am feeling so burnt out after work or if it is because all of my knitting seems like crap right now, but for some reason I just have no real desire to pick up the needles. 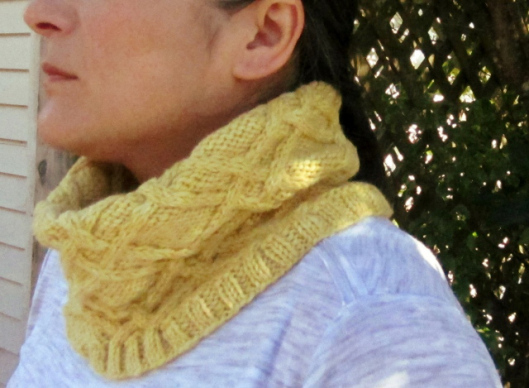 Today, I’m delighted to release the pattern for the Latticework Cowl. This cowl was knitted in the round from just less than one skein of Maniototo Wool in the Tussock colourway. The yarn shows up the latticework cables beautifully – you can see the latticework fencing inspiration for this design in the background. 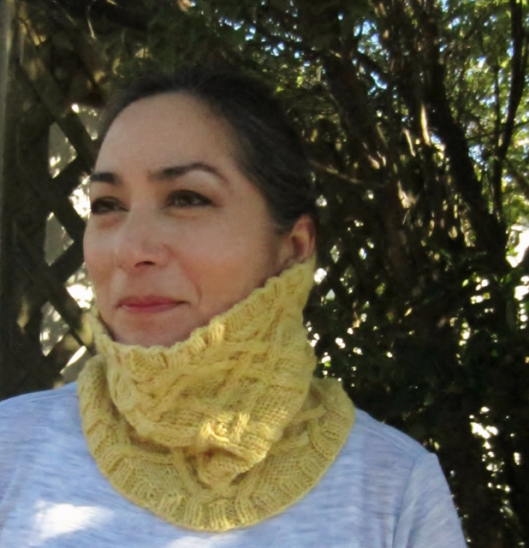 The design can be worn two ways – turned down for those warmer days when you prefer a bit of air around the neck, and full length, when insulation against the wind and cold are a premium consideration! The cowl takes around 180m of worsted weight/aran/10 ply yarn. It’s a great stash buster, taking only one 100g skein of yarn and (I hope you agree) it’s a stylish addition to the winter wardrobe. I’ve been wearing mine this week now that the weather has finally turned – and feeling rather grand! Thanks again to the eldest boy for the photographs.